Encouraging live music in Hungerford since 2002. 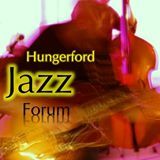 The Hungerford Jazz Forum was set up by Andy Richardson and George Wicks in 2002. Beginning and intermediate players are welcome as we recognise that doing it for real is the best experience there is. Woodshedding is essential but it's a waste of time if you don't get up and blow! The idea behind HJF was, and still is, to give performers of all ages the opportunity to perform for a live audience in a friendly environment. HJF is pleased to recognise the support from a wide range of musicians and we are proud that we also have support from young musicians who are still at school.